← You have to try my favorite chocolate cake, it’s Crazy…. Milky Way without caramel is just not a Milky Way. If this were the candy Olympics, it wouldn’t be a medal contender. U.S.A. wins! The only positive that I can take from this is that I didn’t eat more than 2 bites. Thanks to Wikipedia for the images. Posted in Don't bother, Milk chocolate. Bookmark the permalink. 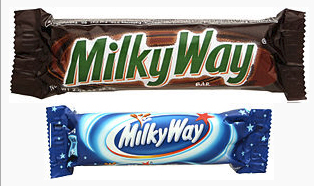 Interesting….In the UK we would call the American “Milky Way”, a “Mars Bar”. It has the caramel you expected and seems to be a similar size and has similar coloured packaging. Thanks Kate, how interesting, a Mars Bar here in the U.S. has almonds. I wonder why these bars are so different. By the way, the U.K. makes wonderful sweets! That was exactly my thought as I read the post. In Australia it’s exactly the same. A smaller Milky Way and the larger Mars Bar. Although our chocolate tastes slightly different to the UK version, because we need different sweeteners and solidifiers to cope with the higher temperatures. Thanks, do you think the different ingredients in the chocolate affect its taste? Definitely. The US seems to use corn syrup as a sweetener so I found it too sweet, and the UK isn’t as creamy. (Although I think whatever you grow up with is what you love the most.) I also noticed Coke tasted different too.